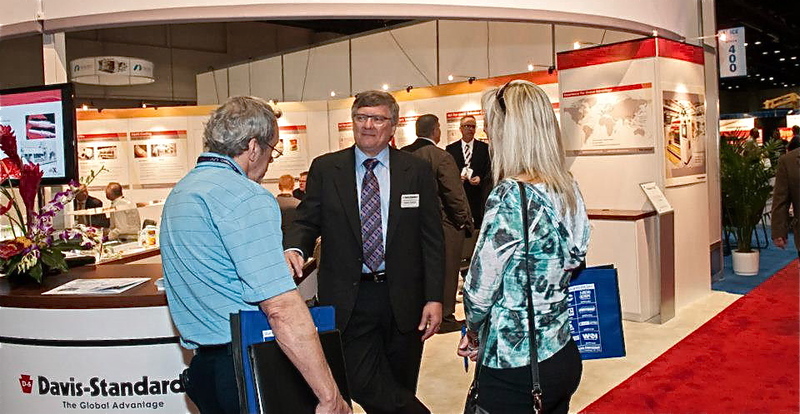 Boasting almost 350 exhibiting companies on the show floor, the second edition of ICE USA (International Converting Exhibition) closed its doors last Thursday with visitor attendance up about 10% over the premiere 2011 show. It was a good event in terms of quality of attendees. As David Tellett, CEO of organizer Mack Brooks Exhibitions, said, “They’re decision-makers and not tire-kickers.” As of the show’s second day April 10, visitors had come from 45 different foreign countries and 45 different US states, the ICE USA show floor was about 35% larger than last time, and conference attendance was up 15% as well. The following pics (provided via Mack Brooks) will give you a taste of the event. 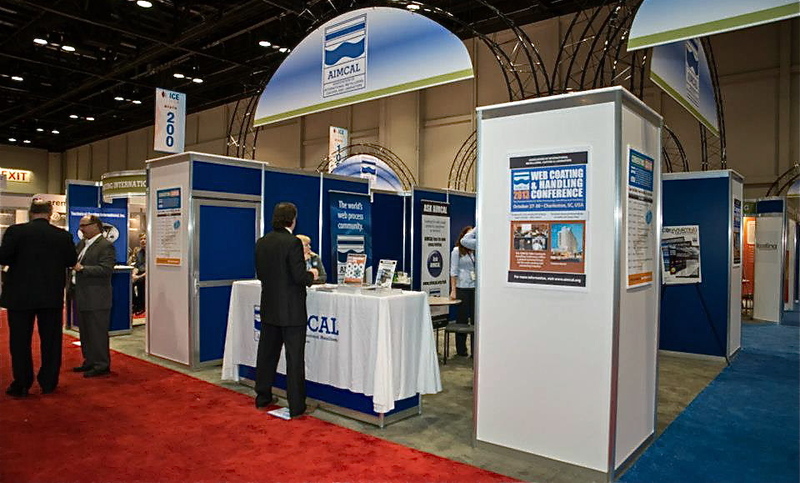 AIMCAL brought together two dozen member companies in a 4,000-sq-ft pavilion that saw continuous traffic during the three-day show. With the largest display on the show floor, New Era Converting is reportedly contemplating taking even more space for the 2015 event. 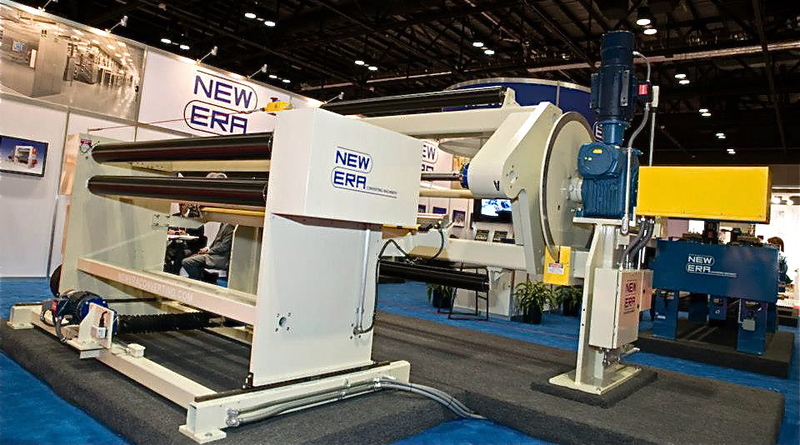 The supplier showed off its Automatic Cut+Transfer Turret Winder, a complex coating system and more. 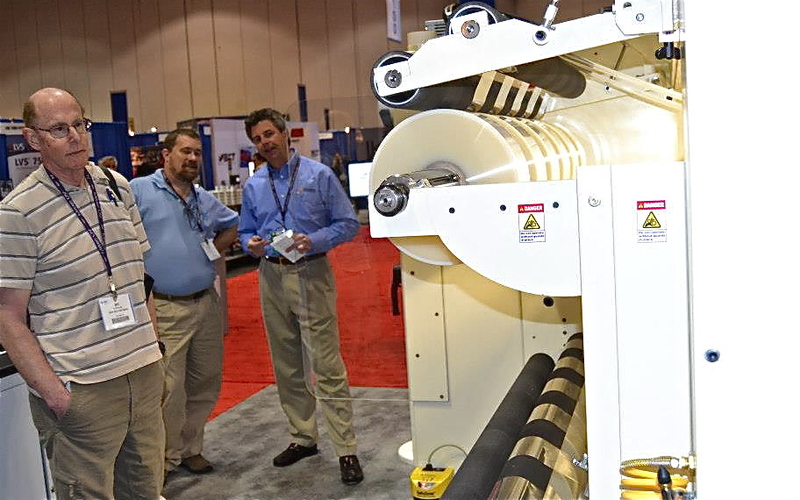 Davis-Standard staff were on hand to educate attendees about its many coating/laminating and converting process systems, including the new dsX flex-pack™ extrusion-coating line. Among the handful of slitter/rewinders running at the show was Parkinson Technologies’ Model Genesis 700SL center-driven, duplex system. The shaftless unit, with widths to 62 in. and unwinds to 40 in. in diameter, operates at up to 1,500 fpm. Deacro displayed two running slitter/rewinders. In addition to the model above, it showed the Model C610A, a cantilevered system. 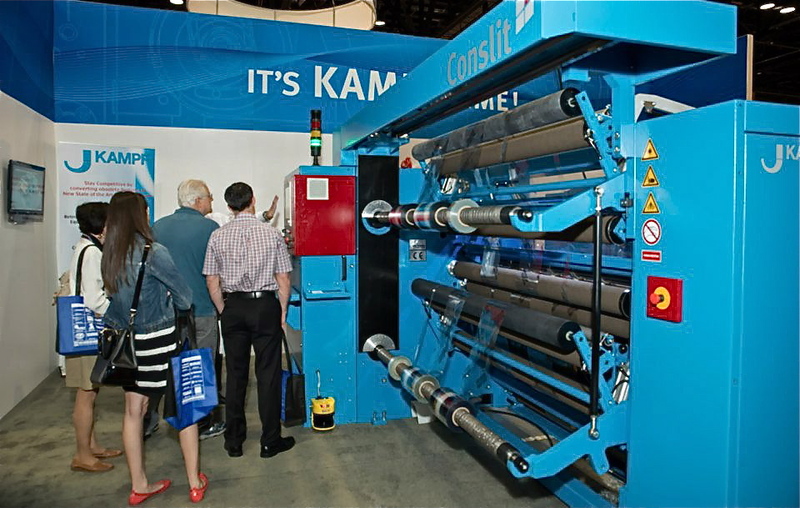 Kampf Schneid- und Wickeltechnik GmbH exhibited a Conslit slitter/rewinder. The company recently sold its 750th Conslit system to a European customer. 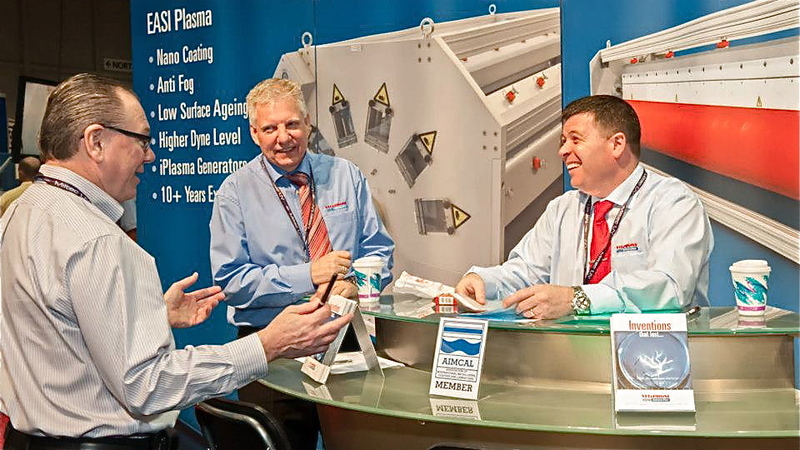 Vetaphone North America touted its parent company’s new alliance with Coating Plasma Industrie of France. The two suppliers will collaborate on surface treatment methods for nano coating, anti-fog properties, low surface aging and higher dyne levels. 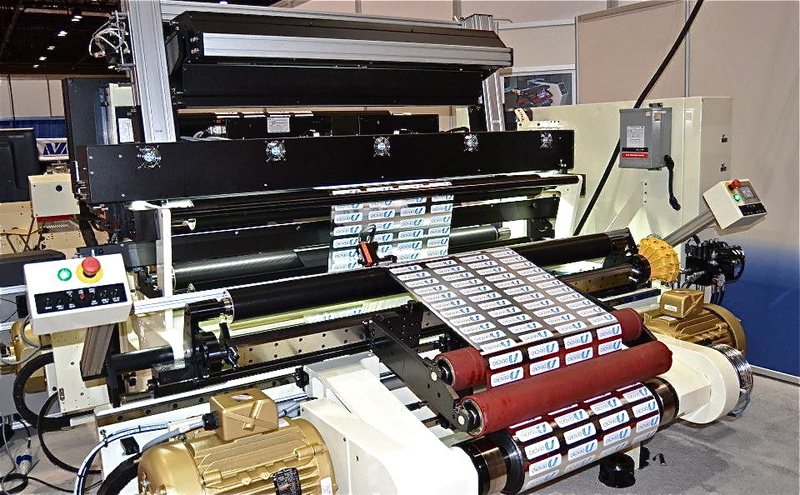 This entry was posted in coating/laminating, flexible packaging, labels, slitting/rewinding and tagged business, converting, extrusion coating, flexible packaging, ICE USA, labels, manufacturing, packaging, plastic film, slitter rewinder, slitter rewinders, technology. Bookmark the permalink.